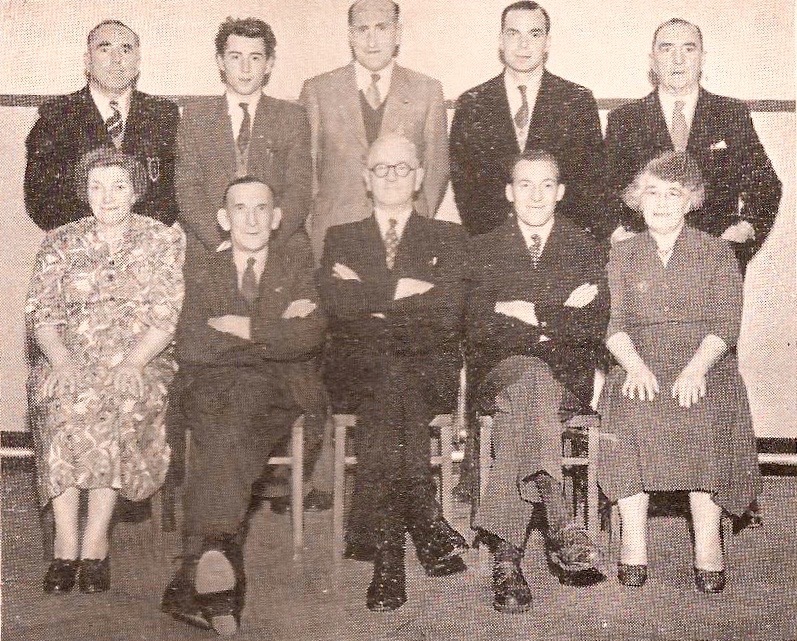 Cambridge United Supporters’ Club Management Committee, 1954. Standing, from left: Mr J Blackwell, Mr R Clifford, Mr E Ward, Mr D Grant (Hon Treasurer), Mr H Brown. Sitting, from left: Mrs J Morgan, Mr W Harrison, (Vice-Chairman), Mr H Habbin, Mr PC Neal (Hon Secretary), Mrs L Harrison. Tom Gurney, Vice Presidents' Club member and long-term supporter, was instrumental in the development of Abbey and Cambridge United and the Supporters' Club in the post-World War II days. He wrote this article – Fifty Years on the Rollercoaster – in 2001. It was a warm, sunny September afternoon in the September of 1946 when my recently acquired father-in-law suggested we go and watch a football match to be played on Coldham’s Common. Avoiding the cowpats that littered the pathway like landmines, we joined a small band of pilgrims going in the same direction. Before we reached the ground a strong smell of pigs came along on the gentle summer breeze. ‘It’s from the allotments,’ confided a fellow traveller. The little ground, which was alongside a flooded quarry and sandwiched between the Newmarket Road and common land, looked pretty attractive to me after the grey war years. At that time there was only one entrance to the ground, and that was from the Newmarket Road. Just inside the ground and to the right was a long, low wooden shed, which was the refreshment centre. Way down the same side, where the Habbin now stands, was a wooden hut that was the changing rooms, with a fenced enclosure for the players and officials. On the opposite side stood a sturdy stand that housed 250 spectators. At 2.50 precisely, the two teams trotted out on to the park. Captain and full back Joe Richardson led out the Abbey United, resplendent in amber and black quartered shirts. The first campaign in the United Counties League had begun, and it would be carried to Bourne, Eynesbury, Spalding and other well-known places. Wisbech Town was a bit special in those days. As a Londoner, I had been brought up on a diet of ‘Boy’ Bastin, Alex James and the big, bustling Ted Drake. My Services football had been played alongside professionals, some with international pedigree, but I was sold on the bright, breezy ‘get up and go’ atmosphere of this friendly club. It was known then as a family club, and a family club it is to this day. Two management committees were set up in 1947: a Supporters’ Club Committee mustered at the Corner House on the corner of River Lane. It was a group of families – the Barkers, the Harrisons and the Morgans – that was to be the mainstay of the club structure. They were tough, determined and dedicated – and that was just the ladies. Reg Barker became the first team trainer. The Georges gave their son Albert to play up front in the first team and the Morgans their son Arthur as goalkeeper. In the background, Mr Morgan and Mr George were sent out to do whatever odd jobs required doing. There was Lily Harrison, the mighty generator of money through lotteries, raffles and the general mugging of fans. My friend through all the years was Percy Neal (brother-in-law of player Russell Crane), who later became part of another fundraising unit, the Cambridge & District Sportsmen’s Guild. A Planning and Development Committee was installed, with headquarters over the Globe public house, which still stand opposite the ground [although under a different guise nowadays]. More by chance than judgment, there was a fair balance of talent. The then Chairman of the Supporters’ Club was Harry Habbin, landlord of the Corner House. The first chairman of the PDC was a Mr Wadsworth, executive of a soft drinks firm. The Secretary at the time was Master Builder King. As the club began to turn towards professionalism, Mr Wadsworth, a staunch supporter of the amateur game, stepped down and Mr King became Chairman. Things had started to look up. The Francis family had released the ground to us for a modest sum and we were now landowners. An old Polish gentleman, succeeded by the Darlers, have shown their appreciation by tending and nurturing the splendid bit of turf. Moving between committees was a quiet man from Ipswich, Geoffrey Proctor. He picked me out as an engineer and I found myself in the back parlour of a general store opposite Barnwell Road owned by Geoffrey. He had a special way about him. ‘What do you think of our little club, then?’ he asked, gazing past me to some far horizon. I think our players must have been fed on a diet of carrots: they played some cracking stuff in the gloom. Redundant Government supplies were going at knock-down prices. We phoned around and our volunteers, with clear instructions on what was required, came back with one much larger, saying it was in better condition and bigger than the one ordered. Sometimes the volunteers’ enthusiasm would exceed expectations and make life difficult. However, the installation was to serve its purpose until the changing space was moved to a site under the present police box [in the north-east corner of the ground]. The wooden fence that separated the ground from the allotments was also replaced by a brick wall constructed by the first class bricklayers enlisted from our ‘Sunday Squad’. A second entrance to the ground was established at the allotment end when the brook was crossed with a single bridge purchased from the Atlas Cement Company. 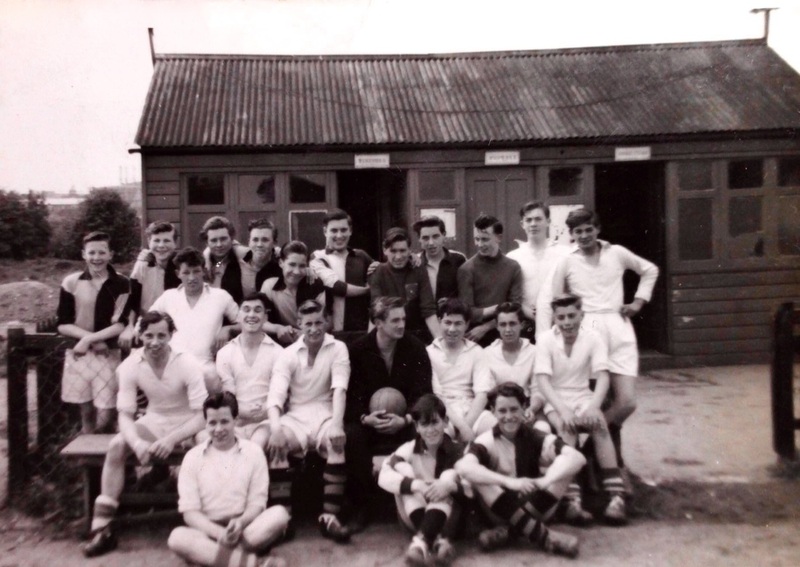 Boys from the Central Youth Centre in York Street pictured in front of the Abbey's changing rooms in the early 1950s. Lifelong U's supporter Tony Collins is pictured front left. 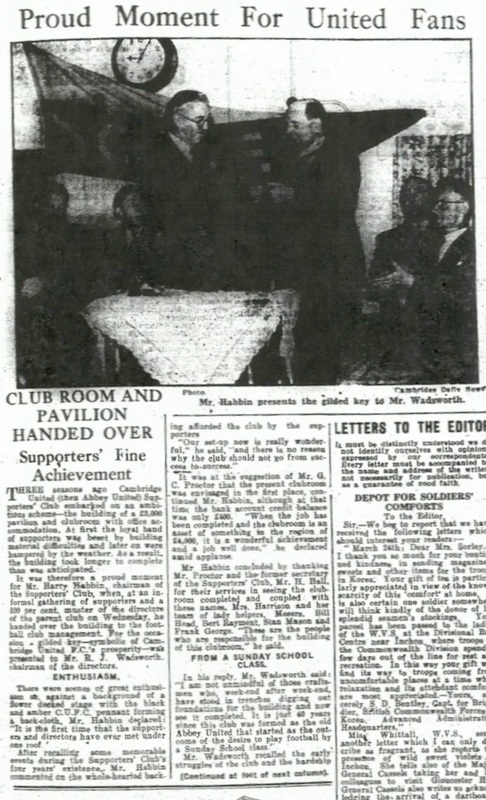 The Cambridge Daily News of Friday, 2 May 1952 reported that the new' clubhouse – symbolised by a golden key – had been handed over to the Chairman of the parent club, Mr RJ Wadsworth, by Harry Habbin, Chairman of the Supporters' Club. Mr Habbin noted: 'It is the first time that the supporters and directors have ever met under one roof.' He also paid tribute to Geoffrey Proctor, whose suggestion the club room was at a time when the club had just £600 in the bank. The asset was now valued at £4,000, he added. It was then decided that the players needed some lighting for the dark evenings. A genial electrician by the name of Bob Blackwell wired in some stand lighting with extra light sources under the stand’s protecting canopy. An old friend who was a senior engineer with the electricity board complained bitterly that, should I require an electrician, all his staff would volunteer, but if Cambridge City needed one then he was obliged to go himself. The Supporters’ Club was completed in the summer of 1951 when, on one sunny evening, Geoffrey Proctor and myself sampled the first bitter from the newly installed beer machine. A rare smile from the master: ‘Not bad, not bad.’ I was never sure if he meant the beer or the fast completion of the club. However, we were again nearly broke and, with autumn approaching fast, heating became a priority. We installed two cast iron tortoise solid fuel stoves. They became legend. The fans would sit around them retelling tales of deeds on the Celery Trenches and confiding the latest crop of rumours, which were often more exciting than facts. The beer connoisseurs would add a little iron to the brew with a red-hot poker. The stoves created the atmosphere of the ‘Ole Bunkhouse’, and when some complained I reminded them that the cathedrals of England were heated from similar cast iron sources and that they were privileged. Later, through the efforts of the Sportsmen’s Guild, money was found to install a new boiler and radiators. Oh, those lazy, smoky days! I upset Geoffrey on the commissioning of our first floodlighting. He had found a very talented retired flight engineer who had a small engineering unit. To suit the club’s immediate needs, he had constructed some floodlight sources, through the good offices of some friends in the GPO. Telegraph poles were erected around the ground and the floodlights installed in time to play Eastern Counties League Great Yarmouth. ‘I think this lighting is up to League standard, don’t you?’ beamed Proctor. If I’d had any sense I would have said, ‘Yes, Sir.’ Instead, I said, ‘No, not really, Geoff.’ ‘You don’t know what you’re talking about, growled Proctor. Doubting my technical knowhow, the next evening I took a light meter to the ground. On the touchlines the needle just lifted off the zero pin. As I moved to the centre circle, it dropped back to zero. I think our players must have been fed on a diet of carrots: they played some cracking stuff in the gloom. It was at this time that Bill Whittaker joined the club; goodness knows what he thought to it. Shortly after this, my work took me back to London and I was able once again to enjoy my football on the terraces during visiting weekends. Geoffrey Proctor was soon back talent-spotting. He found another industrious fan by the name of Reginald Smart Esq, and look what has happened to him. Reg is the last surviving link with the old brigade – he works on the ground; have you seen him on the end of a pneumatic drill? All this despite worries over perennial problems: lack of money, player performances and the flak he receives from the fans. I am glad my interim departure from the club gave a respite. When I came back to Cambridge I was collared by another eager beaver by the name of Matt Wynn, but that’s another story. It was a pleasure to work with the best bunch of football supporters I have ever known.